It is definitely obvious how much will cost you visit the Theme Parks in Orlando, and with all the existing parks Magic Kingdom, Epcot, Universal Studios, Hollywood Studios, Island of Adventure, Seaworld, Legoland etc, the budget can be a mess if we don’t plan and look for the right information but also for the good promotions available on the market of discounted tickets for theme parks in Orlando, your vacation can turn into a night mare. * Decide the theme park of your interest, Orlando Florida have about 8 theme parks, the most representatives and recommended for first time visitors are Magic Kingdom from Disney, Universal Studios and Island of Adventure of one same company and Seaworld a totally different company. 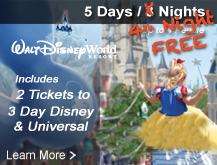 * Match the costs per person using as reference the days that you will visit theme parks. The average price to attend for only one day to one these theme parks is around $100 dollars per person over 10 years old. If you are traveling with children between 3-9 years old there are not a big different on the price and you can expect to be paying about 5 to 15 dollars less that the ticket of an adult depending on the numbers of day that you purchase. 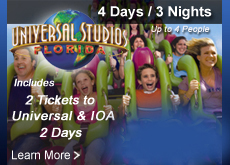 Vacations to Orlando can have all the preferences and all of the tastes. If you love Disney and have space on you budget Disney philosophy to save on tickets is the more you buy the less you pay but remember that this apply only for the admission to the theme park you still need hotel accommodation, food, parking and related expenses. Orlando Discount Tickets USA has promotions to travel for less price of what originally the cost of your vacation and it is by attending to a Resort Preview one of the days that you are in Orlando you can get saving that star en $200 dollars of the cost of your vacations, this participation does not require financial obligation in order for you to receive your tickets even the resort may offer awesome offers to not overlook.. As a company we have contract with Orlando Hotels and Great Resorts close to the Disney Theme Parks so you can get preferred rates.